The local organizer of a refugee shelter in Germany says right-wing extremists threatened to behead him after the building was badly damaged in an apparent arson attack. The refugee housing project has been a focus of intense confrontation over the past few weeks between its supporters and opponents in Tröglitz, a town of 2,700 residents where unemployment is higher than average and the local economy is depressed. On Saturday night the building, which is planned to accommodate refugees, along with security guards and social workers, from mid-May was reportedly set ablaze, further escalating the tensions. Ulrich points to far-right activists as the likely source of the apparent arson, and says he received personal threats over his position. Earlier in March, Tröglitz Mayor Markus Nierth stepped down after the right-wing National Democratic Party (NPD) said it would picket his home in a protest against the refugee shelter. The 46-year-old official said he and his family didn’t feel safe with the level of protection offered by the police and that he didn’t feel enough support from fellow citizens and officials. Tröglitz has traditionally relied on employers such as fuel company Brabag, according to Der Spiegel. Now the economy is slow, jobs are scarce, and far-right critics of the council say that hosting 40 foreigners is not the best way to spend 6.5 million euros the state budget allocated for refugees. The far-right NPD, which is legal in Germany and has several seats in two state parliaments, capitalized on the uncertain situation and launched a vocal campaign against the planned shelter. Some 30 of their activists were present at a town meeting of 500 people that Ulrich organized last week to campaign for the refugee cause. The stand-off escalated days later when the building planned for the refugee shelter caught fire in the middle of the night. Nobody was hurt in the incident as two people present at the time, a 50-year-old woman and 52-year-old man, escaped unharmed after a warning from the neighbor. 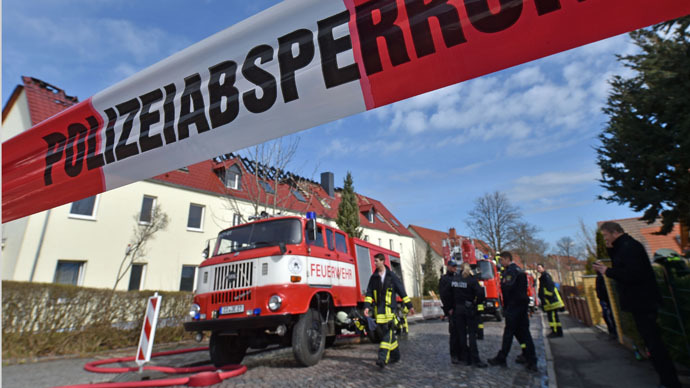 The Tröglitz fire has been viewed by many as a symptom of rising xenophobia in Germany. Embracing asylum seekers has become a major point of Chancellor Angela Merkel’s policies as Germany witnessed the rise of self-styled “anti-Islamization” movement Pegida. The movement, viewed by its opponents as racist, drew thousands of supporters to their marches and has spread to other European countries. Pegida’s anti-immigration rhetoric and level of support came as an embarrassment for the German government. The country’s painful past under Nazi rule makes the country particularly sensitive to issues of racism and xenophobia. The number of asylum seekers in the country jumped 60 percent last year, according to the Federal Statistics Office.